A Bundy supporter outside the Las Vegas court house. Now, as a series of federal trials has begun for the 2014 standoff near the Bundy ranch, his followers are regularly using Facebook Live to do their own reporting on the cases. Experts who monitor radical and extremist groups say the militia movement in particular has always used newsletters and chat forums to reach its followers. But social media, with its unfiltered and instantaneous nature, has helped galvanize the movement and reach people far beyond the American West. Few local — and even fewer national — news outlets are covering the minutia of the court proceedings against the 17 defendants facing a range of felony charges for their role in the Bundy Ranch standoff. 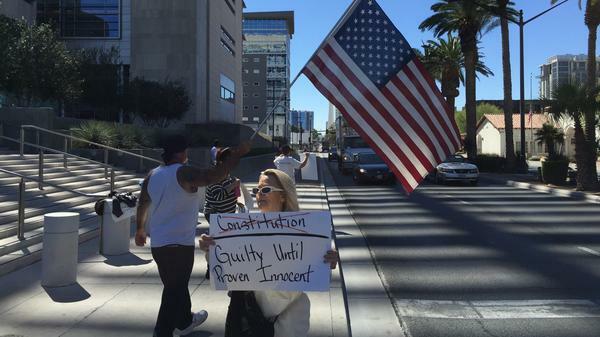 But regularly, a small group of self-described patriots takes to Facebook Live outside the federal courthouse in Las Vegas and livestreams reports of the daily proceedings. Cellphones and recording devices aren't allowed inside. During the lunch breaks, and after court adjourns for the day, Andrea Olson-Parker, the wife of one of the militiamen on trial, provides a painstaking readout of the court proceedings. With her husband facing a prison sentence of more than 60 years, she often mixes in commentary. "The more I do this, the more I hear other people that have been railroaded by the exact same system that's doing this," she says. The Bundys have a deep mistrust of the federal court system, political elites and especially the traditional news media. Shawna Cox, a close family friend and one of the defendants acquitted for occupying the Malheur National Wildlife Refuge in Oregon, says social media allow for the movement to bypass the traditional media, which many of them see as one player in a much larger, corrupt system. "You have to have somebody you believe," Cox tells NPR. "If it's somebody that you know or trust that's giving you that information, that's the line you're going to follow." Cox says social media is a powerful recruitment tool. "Because one person will be here on the ground and they'll send it out, and they'll share it and Facebook goes ballistic." There are plenty of examples of political fringe groups on both the right and left using social media to advance their message, and part of the effectiveness of this can be owed to the fact that a growing number of Americans on the right say they don't trust the news media. Spend some time with the Bundys and their followers and it's easy to see that there's just as much of an information divide in this country as there is a divide over politics, or rural versus urban. "I don't think anybody trusts the media, they don't trust agencies, they don't trust really much of anybody," says Erika Schumacher of the University of Nevada, Las Vegas. "They're going to look for whoever they identify with and that's who they're going to believe." Schumacher recently retired from the federal Bureau of Land Management. She coordinated federal law enforcement's response from the ground at the Bundy standoff in 2014, a tense and stressful several days where many federal land managers worried of a bloody shootout. More than three years on, she's still frustrated. "We never got ahead of the message," she says. "We never articulated why we were out there." While the militants could comment online as the drama unfolded, Schumacher says the BLM was responding only to traditional news outlets, hours, even days later. "Even if we did get it out there, there was already this other stuff that was being said. Our piece [was] forgotten," she says. Recently, as the Nevada trials have begun, some of the men's wives have been taking to Facebook with tearful and often heartfelt pleas to be heard. Angie Bundy, wife of Ryan Bundy, recently thanked her followers on Facebook while sitting in her car before heading into one of her kids' music recitals. And Brianna Bundy, wife of Mel Bundy, read a letter she wrote to Interior Secretary Ryan Zinke. Those emotional pleas help the movement's ongoing PR messaging battle with the federal government. Mark Pitcavage, a senior researcher at the Anti-Defamation League's Center on Extremism, says the family's legions of online supporters tend to be divided up between militia sympathizers and those who say they don't recognize federal control of public lands in the West. "The main thing they use it for is propaganda," Pitcavage says. But calls for an armed revolution are few within the movement, he says, which casts itself as "defensive" by nature. The Bundys view themselves as protectors of the Constitution, albeit a narrow interpretation, and say they're protecting against an overreaching federal government. "These are radical movements," Pitcavage says. "They're unhappy with the status quo, they want to change society."